Over the last two Mondays I attended a mystery block workshop. The only prerequisite is that you must have paper piecing experience. I have that however, it's been many years since I've attempted paper piecing. 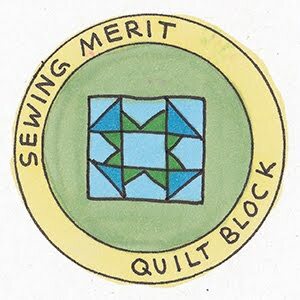 I figured this workshop would be a great way to reconnect with this form of quilting and since I see a Dear Jane somewhere in my future, I thought this would be a great refresher. We received the first half of the pattern pieces during the first session and were required to bring some lights and darks in small prints and a few solids. It took me more time than I thought it would to complete the first week's project, however, I did get faster the second week. At the end of the workshop, I was much more comfortable with paper piecing but I'm not sure I will make more of these blocks. The pattern is very cute but it was very time consuming and I really have a desire to make a flying geese quilt. So I do see paper piecing in my near future, just not in the shape of a boot. 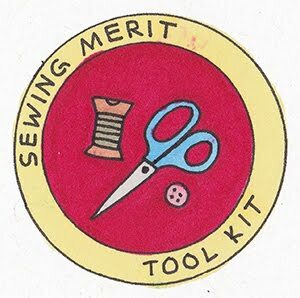 *The workshop was offered for free over at Bungalow Quilting and Yarn in Milwaukee. It's a new quilt shop in town and the closest one to my house. I am so glad to have them close by! Last weekend we had a rummage sale in our neighborhood and my daughter participated by bringing all her baby stuff to my house. That baby stuff always draws a crowd. She was making lots of sales and commented to her father that it's a struggle to hand out change. She tried an envelope which fell apart, a plastic container which meant you have to pay attention to where you put it, and she tried her pockets where money popped out onto the floor with each sale. Her dad had this great idea that she should use one of his nail pouches. So he dug one out of his tool box for her to use. At the end of the day she had commented on how wonderful it was to have her change handy at all times. Transactions were completed much more quickly without the hassle of trying to find the right change and where she put it. She said she wished she had that pouch for the last few years of rummage sales - it was that convenient! After she left for her home, I went to put the nail pouch back in my husband's tool box when it hit me that it would be a great idea to make some pretty ones. And we have craft fairs coming up so it was perfect timing to invent something a little cuter than the ones we had. Now that it's complete, I think I will test it out by wearing it for a while to see if I need to make any adjustments before I make any more. But I do want to make some more. It was quick and easy. 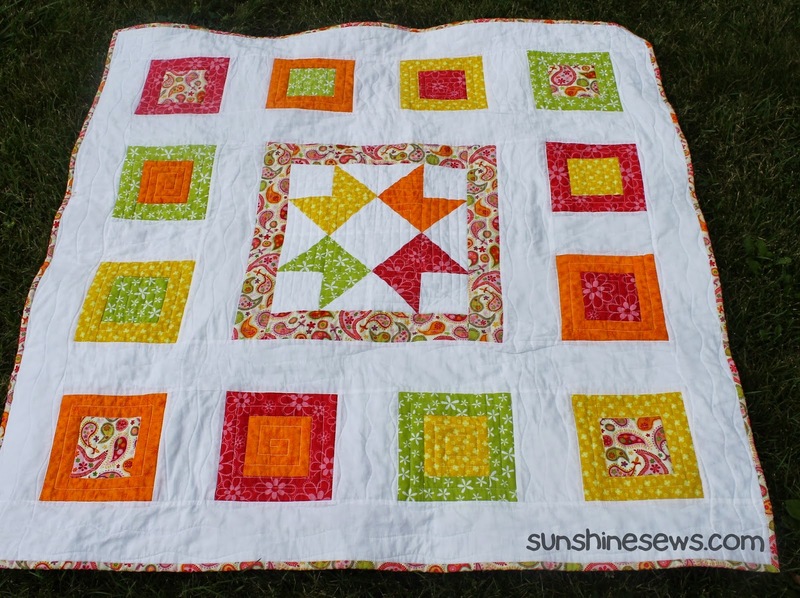 I followed the Ribbon Star block tutorial from the Solstice Star Series feature over at the Fresh Lemons Quilts blog. The instructions for that ribbon star block can be found here. After I completed the block, I decided it was so pretty that I would use it as a feature block in a small quilt. So I framed it in some pretty fabric then got out some graph paper to figure out how to add blocks around it. Once I had all the blocks worked out and the strips cut, it was easy to put together. I was still worried that my math skills would be off as would the quilt. But lo and behold, it all lined up as planned. Yay! I started to quilt the borders with some wavy lines. For some reason I was bored with that but continued on anyway. Once I got all the borders quilted, I couldn't decide what to do with the blocks. The next thing I knew, this thing landed in the UFO pile. It's been there since last spring. With my fresh finish on another UFO, I was motivated to pick this one back up and finish it. A few months ago, I did a quilt-as-you-go block of fabric that I turned into a basket. I quilted it by starting in the center and creating a maze of stitches all the way to the outside of the block. I decided that these blocks should be quilted that way as well. Before I knew it, I had the entire quilt finished. I spent yesterday adding the binding and the label it was completed in no time. I really like the look of this little quilt and it will look good across the back of my sofa for the rest of the summer. I am really digging getting these unfinished objects done! I started this quilt a few years back and it landed in the long forgotten UFO pile. I usually like to finish what I start unless I have trouble with something. Once there's trouble, I usually give up quickly and move on to something else. 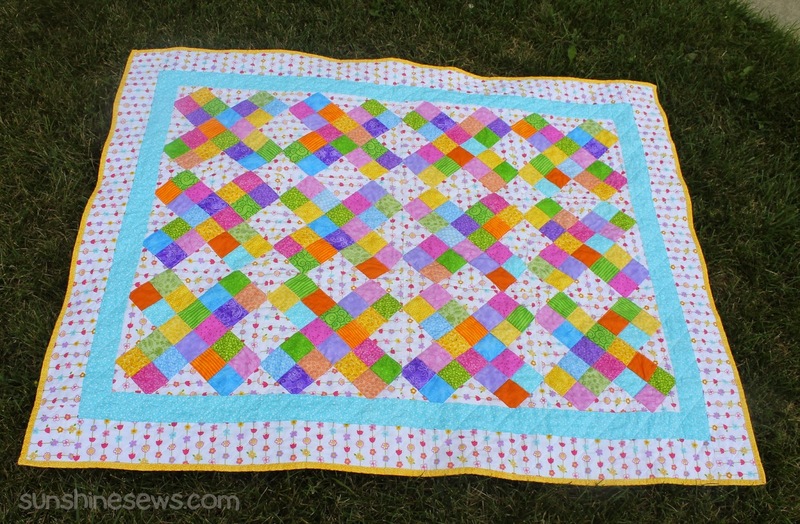 The trouble I had with this one was that I started to machine quilt it without a walking foot. After sewing 5 or 6 rows of stitching, I realized that the layers were not lying nice and flat even though I basted the layers together. There were a few puckers and I really needed to rip out all the stitching and start over. Then time goes by. And I learned about letting some things go. And I learned that a finished quilt is better than a perfect quilt. And I learned that things can be corrected with a stitch here and a tuck there and then just keep going. So I took the quilt out two days ago and started out by ironing it flat. It wasn't as bad as I remembered. And it was fixable without ripping out everything. So I kept going. By the end of the day yesterday I had the quilting done and the binding on. It wasn't perfect but it was done. This morning I threw the quilt in the wash machine and then in the dryer. When I took it out I was amazed at how much better it looked after a little fluff and dry. It feels so amazing to complete a UFO from so long ago. 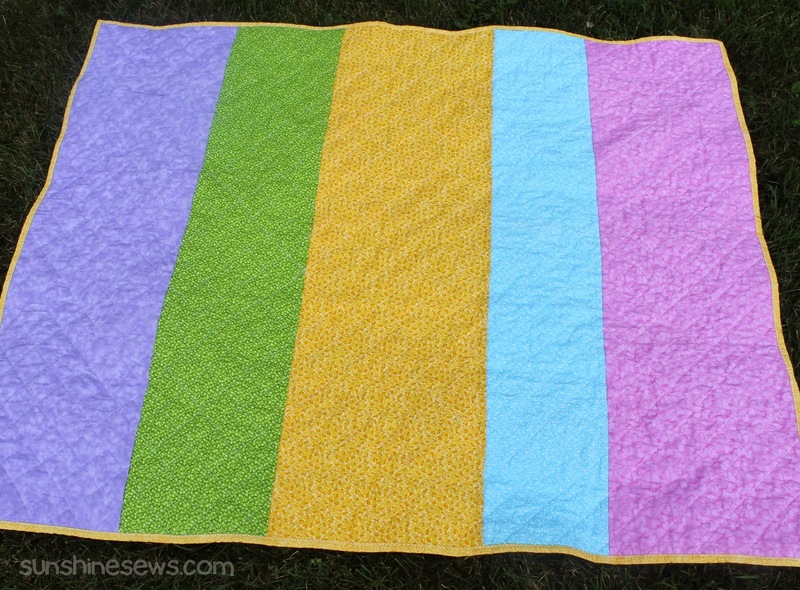 This quilt pattern is from the book Quiltstyle: cool and cozy coverlets by Tammy Tadd. The pattern is called Giddy Walk. I used my Lickety Split pattern to make this bag for my sister. Her birthday is Sunday and when I saw this fabric called Dysfunctional Family, I just had to make a bag for her. She loves that silly kind of stuff. Rae Hoekstra did a modified version of her bag and I liked it more than the original. I found her instructions for the modifications to the bag here. I thought the lining fabric I chose was right for the bag; it complements the colors in the comics in the feature fabric and adds a more feminine feel to the bag. 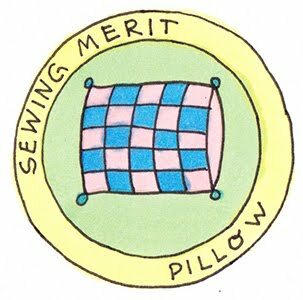 When I saw the big simple plastic button, I thought it was a bit cheezy but it felt like a perfect match to the cute, funny fabric. I hope she will like her birthday present. I made more of these zipper pouches in an effort to become comfortable with the process of getting zippers to fit correctly within a lined bag. Since I am a visual learner, I struggled with the instructions a bit because it really is difficult to get a photo of exactly how these things should go together. After making a bunch of these I think I finally got the process down. Once I had a bunch of the correct size zippers, I went through my scraps in an effort to purge some of the cute fabric scraps. I ended up cutting fabric for 11 pouches. Unfortunately, I ran out of the lobster clasps when I got to the ninth pouch so I will have to order more if I want to finish the rest of what I've already cut out. I did learn that not all fabrics are great choices for these little pouches. The fabric that shows above the zipper is exactly 1 inch, so if the print is too big you can't really tell what the image is. And if the fabric has text on it, because the back panel is folded to the front your fabric is going to be upside-down on either the front or back depending on how you sew the fabric to the zipper. For the most part, they are pretty cute. I used the tutorial found here to make the pouches. The only change I made is that I added 1/8 of an inch to the sides of the pieces which allowed ease when sewing the side seams around the zipper. 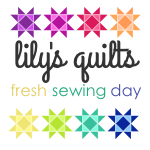 I've been following the Lily's Quilts blog for quite some time. The blog is pretty and someday I am going to follow Lynne's paint chip block tutorial and make something. It's on my very long "to-do" list but moving towards the top much quicker than I thought it would. I guess that means I am making some good progress! 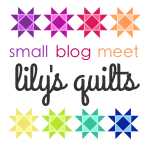 Today I read about Lynne's small blog meet linky party and just love the opportunity to get to know more quilty people, especially those like me. 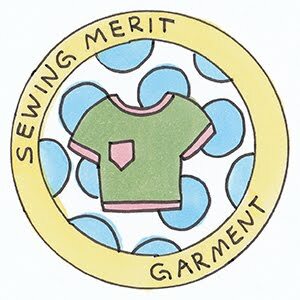 This will be a great way to get some exposure on my own blog and hopefully more encouragement since some of the best quilty advice comes from other quilters. I love the idea of getting to know others through their blogs and gaining more inspiration. Link up if you are a blog with fewer than 50 followers and would like to get to know a few more people out there in blogland. Write a post about this feature, add this button and then link up. Next go and visit and get to know at least four other linked blogs - starting with the two above you in the linkys and the two below you. Visit those blogs, leave a comment, click to follow and visit that blog regularly over the next few weeks. Visit more if you have the time. And also visit back any new bloggers who come to visit you and get to know them and their blogs. I added the link to the image above and to my sidebar on my blog so we can all connect. So welcome to my blog, I look forward to meeting all of you! This is going to be fun. I want to make some zipper pouches for an up-coming craft fair so I started testing out a variety of patterns and tutorials. I've settled on the tutorial I found over on the Craftster blog. The instructions weren't difficult to follow and it didn't take very long to complete. Once I finished my first pouch, I decided to make one a little larger just to be sure. 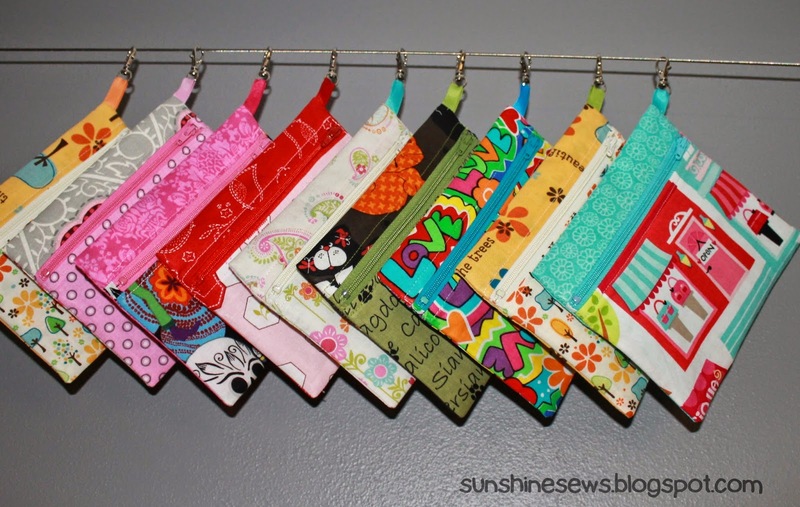 The first pouch used a 6-inch zipper and the finished size is 5 inches x 6 1/2 inches. My modified one used a 7-inch zipper and measures 6 1/2 inches x 8 inches. I do like the smaller original pouch better for this project so I'm going to start making many more. The link to the tutorial can be found here. As for the larger one, I think because there is no interfacing in them, they seem too weak to hold stuff. Maybe I will try a quilted version of this one sometime to give it more heft. 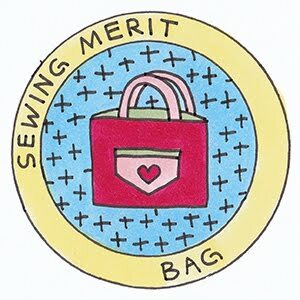 I've been thinking about tracking my quilty progress in a new way. I am calling it "What's on the design board?". On the first of every month I plan to take a photo of my design board and post the photo. Hopefully when the next month rolls around the same projects won't still be on the board. It should also serve as some incentive to actually get those projects moving when I feel uninspired (or darn right lazy). I have flipped and moved these quilt blocks every which way hoping that the right color combination will just appear. What makes this quilt top different from most I've done is that no matter how I move the blocks around, I think they all look good. It's a nice problem to have but it still makes me unsure as to when I should stop moving them around! I even took a photo every time I moved the blocks because I've found that quilt tops look a lot different in a photo than they do on the design wall. I don't know why that happens but it is a good test for the final product. I finally asked my daughter to help me decide and this is the one she liked best so I'm ready to sew the blocks together. Hopefully I won't change my mind tomorrow. 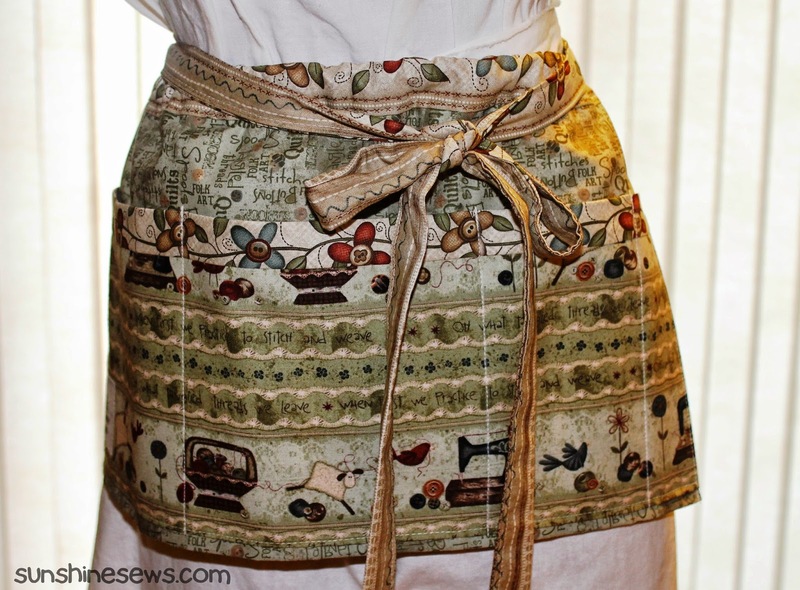 I am going to add this post to the Fresh Sewing Day group over at the Lily's Quilts blog. Lynne is having a linky party on the first of every month to show off what we're all working on. So here we go!